Superuser training is designed to get you to full Usability Mapping competence by working in your offices, on your organisation’s documents with a certified Usability Mapping Trainer helping you every step of the way. You will learn how to engineer usability compliant user documents using MS Word with UMAP IT. 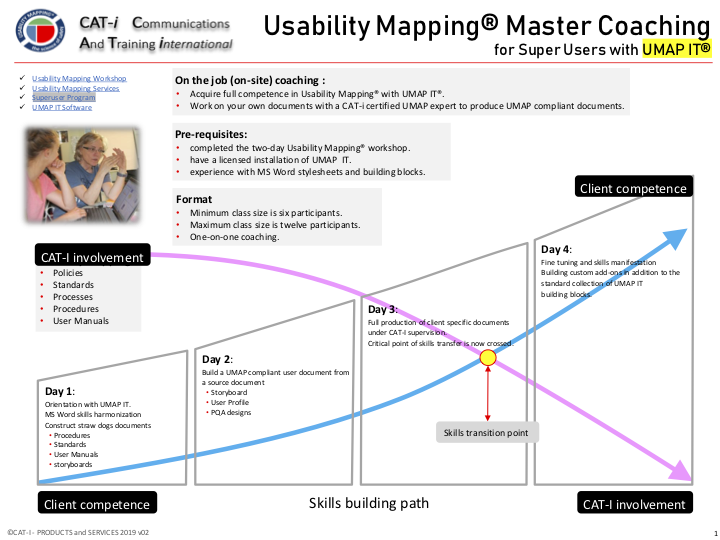 This learning experience in on-site with a CAT-I certified Usability Mapping Coach. During these four days of coaching you are producing documents for your company. In short, you are at work in your office while being supported by a UMAP Coach. You will acquire skills mastery in word processing with MS Word and the add-on UMAP IT. You will complete several documents for your company for final review, or release. You will be certified and get a framed certificate for Usability Master and Auditor (as approved by the World Usability Congress and the UXQCC). One-on one coaching augmented with group discussions an information exchange about the learning progress with your peers. Bring your own source material you intend to usability map. Note: Do not try to map documents for other people unless you have a 100% familiarity with the purpose and the content. We are not training you to become a contract writer for others. Booked by appointment only. A minimum of 6 qualified candidates is required.